SUITABLE for life science applications, the newest Genesis lasers from Coherent is aimed at instruments where space is at a premium. Measuring just 250 x 51 x 138mm, the Genesis CX 355 STM Compact is only half the size of others in the range but still has output power of up to 100mW. The CX 355 produces a continuous wave laser at 355nm and with TEM00 beam quality, using Coherent’s optically pumped semiconductor laser (OPSL) technology. The company says the Genesis range is the first commercial solid-state alternative to ion lasers for applications needing true, continuous wave, ultraviolet output. Other solid-state UV lasers in this wavelength and power range can only deliver quasi-CW output with extremely high peak power that can damage live cells, it says. 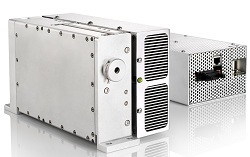 Coherent also says that Genesis lasers offer several advantages over ion lasers including solid-state stability and reliability, an order of magnitude increase in electrical efficiency, no need for water cooling, a small footprint, and the ability to adjust output power from 100 to 10% with no effect on beam pointing or quality. In addition, OPSL enables an ultra-low noise spec of <0.1% (10Hz to 100MHz) for this UV laser. Applications for the Genesis CX 355 STM Compact include flow cytometry for cell sorting and counting, and other fluorescence-based life sciences instrumentation such as confocal microscopy and high throughput drug discovery. Other models in the Genesis family offer output power up to 250 mW.